The New York Liberty will look to end a 2-game losing streak when it faces the Atlanta Dream on Sunday night at McCamish Pavilion in Atlanta. The Liberty is coming off a loss at Washington on Thursday, while the Dream suffered a setback at home to the defending champion Sparks on Friday night. For New York, this will be the 2nd of 4-straight road games, its longest road trip since the 2013 season. 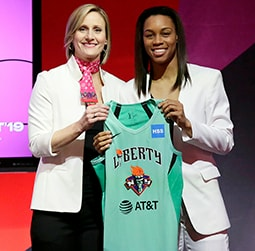 • The New York Liberty continues its longest road trip since the 2013 season when it faces the Atlanta Dream on Sunday night at McCamish Pavilion. This will be the 2nd of 3 meetings this season between the two teams, with the Liberty winning the 1st matchup 76-61 at Madison Square Garden back on June 7. • The Liberty lost its 2nd game in a row, suffering a 67-54 setback at Washington on Thursday evening. 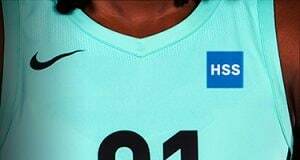 Shavonte Zellous led the way offensively for New York, scoring a game-high 17 points, while Epiphanny Prince, making her 1st start since returning to the team from the EuroBasket Women Tournament, scored 12 points. New York limited Washington to just 30.9 percent shooting from the field, but the Liberty turned the ball over a season-high 21 times in the loss. • The early fan vote returns for WNBA All-Star 2017 in Seattle are in, and a couple of Liberty players are near the top of the list. Tina Charles currently ranks 2nd in the East frontcourt with 12,055 votes, while Sugar Rodgers is 4th in the East backcourt with 3,480 votes. • With 8 rebounds at Washington on Thursday night, Tina Charles moved past Lauren Jackson into 10th place in league history in rebounding. She currently has 2,453 career rebounds, and is just 1 behind Candice DuPree for 9th place. 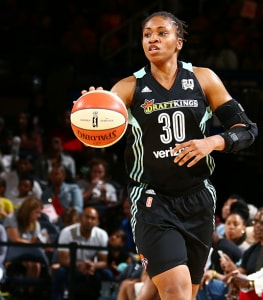 Atlanta Dream guard Tiffany Hayes currently leads the WNBA Eastern Conference guard in All-Star voting, and figures to be in a battle with Shavonte Zellous, who has been putting up her own All-Star caliber numbers this season. Zellous has scored in double-figure in 8-straight games, the 2nd longest streak of her career, and averaged 19.0 ppg during the month of June, while also taking on many of the Liberty’s toughest defensive assignments. Hayes ranks 9th in the WNBA in scoring, averaging 17.4 ppg and is also 10th with 1.3 steals per contest. New York rode a fast start in the 1st half to a 76-61 win over the Atlanta Dream on June 7 at Madison Square Garden. New York jumped out to a 29-17 lead after the 1st quarter and never trailed, leading by as many as 19 points overall. Tina Charles had 18 points and 15 rebounds while Kiah Stokes scored 7 points with a career-high 17 rebounds. New York limited Atlanta to just .276 shooting from the field, as Charles and Stokes became just the 4th pair of teammates in WNBA history to each grab at least 15 rebounds in the same game. On Friday, June 30, Tina Charles and her Hopey’s Heart Foundation along with partner SafeKids Worldwide joined forces with the Boys & Girls Clubs of Metro Atlanta to host a Sports Safety Clinic for Atlanta youth. The kids who participated learned valuable lessons concerning concussion safety, emergency response, proper hydration, and how to avoid overuse injuries. Charles will also donate an AED (Automated External Defibrilator) to the Boys & Girls Clubs of Metro Atlanta. Founded in 2013 after her late Aunt Maureen “Hopey” Vaz, the Hopey’s Heart Foundation has donated nearly 300 AED’s across the world, while also offering sports safety education to youth and providing CPR certification grants. Over the past 3 seasons, Charles has donated her entire WNBA salary to Hopey’s Heart Foundation. Tina Charles eclipsed 4,000-career points last season, becoming the 6th fastest player in WNBA history to do so. She is steadily climbing the all-time charts for points and rebounds, as she is currently ranked 23rd all-time in scoring, with 4,355 points, and 10th in rebounding, pulling down 2,453 boards. 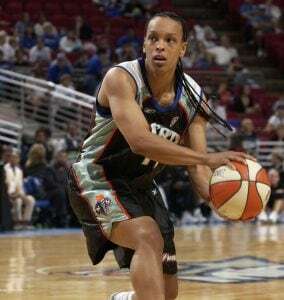 Her career rebounding average of 10.1 per game is the best per game rate in the history of the league. In the 102-93 overtime win against Dallas on June 16, the Liberty outscored the Wings 15-10 in 2nd chance opportunities, improving to 6-0 this season when it wins the 2nd chance scoring battle. Conversely, New York is now just 1-5 when an opponent scores more 2nd chance points. So far this season, the Liberty is averaging 12.6 2nd chance points per game, which ranks 3rd in the WNBA, but over the past two games New York has totaled just 7 2nd chance points combined, with just 3 coming in the loss at Washington on Thursday. Guard Sugar Rodgers did not dress in the Liberty’s game at Washington on June 29, missing the contest with a lower back injury suffered during the 3rd quarter of New York’s game against Connecticut onJune 23. Her current status is day-to-day, and she continues to be evaluated.